You don't have to be superhuman, super kind, super loving or perfect to be able to adopt a child - you just have to be ready. Being ready only happens when you've had time to get used to the idea - and if you are infertile, it is never too early to consider adoption. You can begin gathering information from adoption agencies even though you may not be fully committed. It is always a wise strategy to investigate alternatives in case pregnancy does not occur - after all, statistically, the overall chance of pregnancy for an infertile couple undergoing treatment is only about 50 to 70 percent after one or more years of trying. Also, because many agencies do not accept people over a certain age as adoptive candidates, especially for infants, it is important to collect information so that you don't discover later that you are too old to fulfill a particular agency's requirements. • What kind of children are available for adoption? Aren't they all misfits or discards? • Won't adopted children grow up maladjusted? • What will our families say and do? Will they love a child we adopt? • Won't the child go off to find its birth parents once it grows up anyway? • Why do we have to go through so much agony to build a family? Infertility was one struggle and now adoption with its waiting list is a whole new one. • What will society say? Will our child be accepted by friends and neighbours? As you find yourself more ready to accept adoption as an alternative, these questions often lose their importance. Some of them disappear when you finish grieving for your biological child - the child that never was - and resolve this grief by allowing healing. Through grief, you learn to focus less on the process of obtaining children and more on the children themselves. A couple must, together and separately, come to terms with their loss - to learn to say good-bye, before they are ready to consider adoption. The other doubts disappear after you talk with adoption agencies; adoptive parents and their families; read books about adoption; and learn how adoption is accomplished. The question then is no longer "Can we do this?" but becomes "How do we do this?" You will learn that in many ways families with adopted children are the same as any other families. You'll express love, have disputes and make compromises in your daily lives. Your child will be your child, no matter how you came to have him. Adoptive parenting may be your second choice but it's just as good as biological parenting. It is different - don't try to compare them, one isn't better than the other. However, you will have to deal with several issues that occur only in adoptive families. Prepare yourself to discuss adoption with your child - and to truthfully deal with the myths and misconceptions that many people have about adoption. You may also find that you and your child will often be faced with questions and ignorant comments which assume that adoption is a second-best alternative for all involved. Adoption cannot solve the problems associated with infertility - it is not a cure for the physical aspects of infertility and neither does it cure the emotional pain. But adoption will provide you with the challenges and rewards of loving and being loved by a child. Most adoptions are closed adoption in which the biological parents and adoptive parents do not come in contact with one another. The adoptive parents have only fragmentary, if any, information on the birth parents. Furthermore, adoption agencies make every effort to keep the adoption records closed and unavailable to everyone, including the adoptive parents, the birth parents and the adopted child. 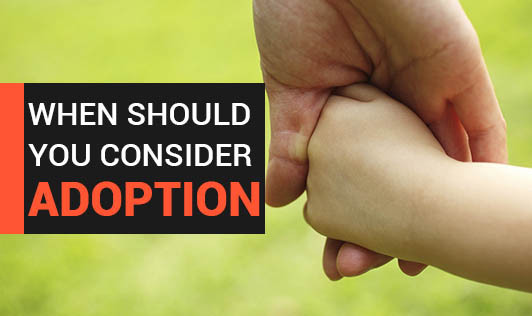 Most agencies believe that the clear separation of the adoptive parents from the birth parents is necessary for the adoptive family to be "normal".